Purpose : To honor and highlight the resiliency, strength, and dedication that a United States Marine Corps wife embodies as she supports our military men and women, families and communities. Nominations are now being accepted for the 2019 award. To honor and highlight the resiliency, strength, and dedication that a United States Marine Corps wife embodies as she supports our military men and women, families and communities. 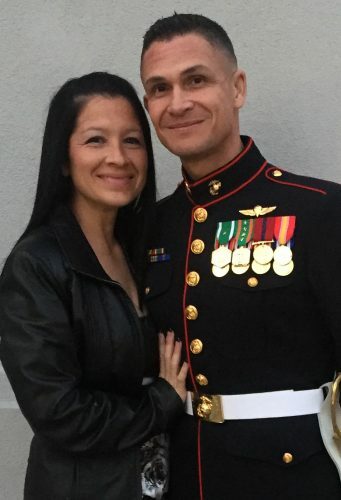 The award recognizes the wife of an active duty Marine whose husband serves in a unit having a home base located in the USMC Southwest Region of the United States. A $1500.00 cash award will be gifted annually to a single recipient in a public ceremony at the Flying Leatherneck Aviation Museum. A plaque and photograph honoring the Irene Ferguson Marine Wife of the Year will be on display for a year at the Flying Leatherneck Aviation Museum. The plaque will be unveiled at the museum in a ceremony to honor the awardee in front of guests including her family and friends. In the past, little recognition was given to the trials and tribulations of the service wife who made it possible for her husband to pursue his service career for the benefit of our nation. In the last decade, the stress and strain on the family has perhaps been greater than ever before. 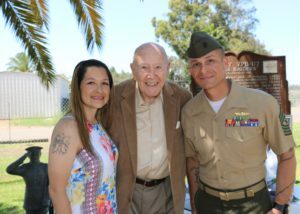 The Flying Leatherneck Historical Foundation strongly believes community support and public awareness of the service and sacrifice of the military wife and family is important. The Flying Leatherneck Historical Foundation has created the Irene Ferguson Marine Wife Recognition Award in memory of Irene Ferguson, wife of Major Glenn Ferguson, USMC (Retired). Nominations are accepted beginning in January of each year and the awardee is announced in May. Deadlines for submission of nominations will be announced with the opening of the nomination period. The Irene Ferguson Marine Wife Recognition Award will be presented to a Marine wife whose husband is currently on active duty and serving in a unit whose home base is located in the Southwest Region of the United States. Applications will be accepted and reviewed by the Award Committee appointed by the Flying Leatherneck Historical Foundation. Nominations may be submitted by supporting agencies but may not be submitted by a nominee’s husband, his commanding officer or by the nominee herself. Q. How is the awardee chosen? A. The awardee is chosen by a panel of Marine wives, past awardees and a granddaughter of Irene Ferguson. Panelists need a complete and well-written application with examples that illustrate how the nominee supports her family, community and/or the country with the resiliency, strength and dedication that characterize U.S. Marine Corps wives. Q. Who can nominate a Marine Wife for this honor? A. With few exceptions, we welcome nominations from friends, family members, neighbors, associates and staff from supporting agencies. To ensure a fair judging process, self-nominations or nominations from a nominee’s husband or his commanding officer will not be accepted. Q. Can a husband nominate his wife? Q. The nomination paperwork states a Commanding Officer cannot nominate the wife of someone under his/her command for this award. Does that mean no one in a command can nominate a wife? A. No. A Family Readiness Officer, or a fellow Marine or Marine spouse in a command can nominate a wife. The Commanding Officer is the one person who cannot nominate a wife in his/her command. Q If the woman I nominated previously was not chosen as the awardee, can I submit an application on her behalf again? A: Absolutely! As long as she fulfills the qualifications, the panel would be thrilled to consider her nomination. Q. Who should be named as a second recommendation? A. You may list another Marine wife, Marine friend, Family Readiness Officer, civilian friend – someone who knows the wife well and can support the nomination if it comes down to a tie breaker. Q. The Marine wife’s husband is deployed. Can I still nominate her? A. Yes. If the husband’s unit is from the Southwest Region, but is deployed elsewhere, the wife is eligible. Q. What comprises the Southwest Region? A. If a unit belongs to the 3d Marine Aircraft Wing or Marine Corps Installations West, they are eligible. Q. How do I nominate a Marine Wife for the award? A. Nominations should be submitted using the link below (to access the online form), or by mailing answers to the questions in the link to the Flying Leatherneck Historical Foundation office at PO Box 45316, San Diego, CA 92145-0316. Please do not submit photos. Q. When do nominations open and when will the awardee be announced? A. Nominations are accepted beginning in January of each year and the awardee is announced in a ceremony in May. Q. Do you have any additional tips for submitting a nomination? A. A well-written nomination with specific examples will help the committee understand why your nominee is so outstanding. We recommend that you compose the narrative response (750 word maximum) for the application in a word processor such as MS Word and then cut and paste your response into the online application if you choose to submit the application online. This will allow you to do a word count and spell check on your response prior to filling out the online application and keep you from losing your work in case you are disconnected from the Internet. There are two ways to submit a nomination: click the link below to access the online form, or mail answers to all the questions included in the online form to the Flying Leatherneck Historical Foundation, PO Box 45316, San Diego, CA 92145-0316. Deadline for Nominations for the 2019 Award is April 24, 2019.